Last week, while I was taking a bath and Kat was assisting by throwing rubber duckies into the tub on top of me, I decided to attempt to distract her by telling her that we were going to start making cookies this week for the holidays. I nearly wept with joy. It was the first time she had asked one of us “why?” about anything! And it was about cookies! It sounded good, and Kat nodded sagely. Ah, she thought she got me with that one, but no! I had a ready answer, and it is even historically accurate. So there we are. That’s why we make cookies at Christmas. Now, as to why I make cookies at Christmas, that is another story. I make them every year, because since I was fourteen years old, that was my holiday job. I did the baking. I made bread, cakes and especially cookies. I wasn’t really allowed to cook anything else in my mother’s kitchen, but since she didn’t much care for baking, and I did it so well, she turned the duty over to me, and I just kept on with it, happily becoming along the way somewhat of a cookie expert. The first recipes I used were the family ones, handed down from great-grandmothers, a couple of them even coming all the way from Germany. And, of course, I used the Toll House Cookie recipe on the back of the pouch of Nestle’s semi-sweet chocolate chips. I insisted on using real butter in all of my baking–my Mom liked to use margarine, but I was having none of that. All of the recipes called for butter, and butter is what I used–who was I to argue with my long-dead great grandmothers? You don’t mess with the ancestors, man–they can come back to haunt you. I also insisted on real chocolate chips, and real vanilla extract too. Mom grumbled, but bought the ingredients I specified, and when she tasted the results, she stopped grumbling. Over the years, I started experimenting, and worked out new recipes, some of which were based on the old family favorites, like my Aphrodite Cakes, which is based on my great-grandmother’s German sugar cookies. Others were based on ideas I had, like what would a cookie with Sichuan peppercorns in it taste like? Would lavender be good in shortbread? What about chilies in a brownie? Why can’t I put toffee chips and cinnamon bits and espresso powder and just use brown sugar in chocolate chip cookies? If Irish Cream is good with cream cheese in brownies, what happens if you add raspberry preserves and Chambord? That is the cool thing about cookies. They are easy to play with. You can add ingredients, subtract them, change them, modify them by chilling or melting them, and you can almost always, if you have a bit of knowledge about baking, come up with something that will taste amazing. Cakes–they are much trickier, and I would not play as fast and loose with cake recipes as I do with cookies. Pies–well, I play with fillings all the time, but I stick pretty close to the general ideas when it comes to the crust. I will add ingredients and change proportions a little, but not like I do with cookies. Pie crust is too fragile to mess with very much, and cake–it is just finicky. But cookies are forgiving. They are easy and they are fast and they are fun. So, I love playing around in the kitchen every year and coming up with new and tasty additions to the holiday sweets repertoire. This year, I wanted to do something new with a chocolate chip cookie. But I didn’t want to overload it like I did with the Coyote Chip Cookies. 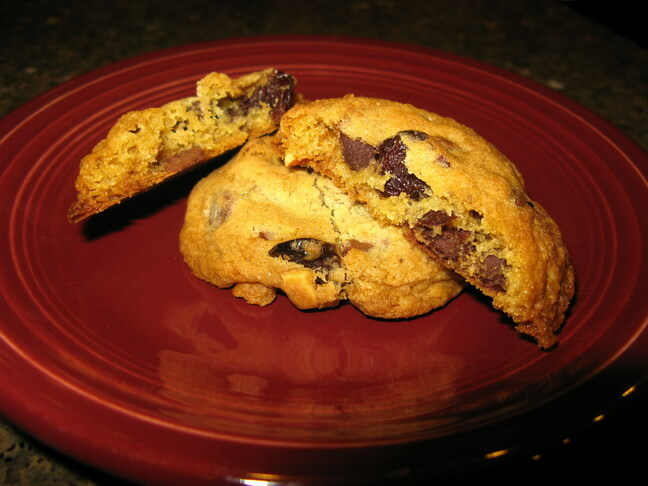 Granted, they are lovely, and I like them a great deal, but Zak is not fond of them, and I wanted to make a chocolate chip cookie that both he and I could enjoy together. What flavors go with chocolate? Coffee. Been there, done that. Nuts? Eh–I have to be careful with that, Zak can be weird about nuts. He likes some of them and not others. Something was niggling at the back of my brain, trying to get my attention and suddenly, I remembered–Zak had just said the other day at the grocery store when we were buying candy canes that he doesn’t know a thing about those because he doesn’t really like peppermint candy, but chocolate covered cherries–those he used to be able to eat by the box. And what is his favorite (non-Jeni’s) ice cream? Cherry Garcia. Ah ha! 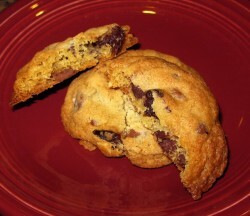 Cherry chocolate chip cookies! Why had I not thought of it before? What exactly is wrong with me? Dried sour cherries added to the usual Toll House style cookie, with milk chocolate instead of semi-sweet, since Zak prefers the former, and some almonds to help boost the flavor of the cherries and add a bit of crisp texture to the chewy fruit and cookies–perfect! Yeah, I was right. The tart cherries are chewy and tangy, and you can taste the cherry flavor very well in the golden cookie, and it pairs beautifully with the rich, sweet milk chocolate. Almonds pair perfectly with both chocolate and cherries, and they added some crunch and the whole thing is just soul-satisfying. There are a few caveats: one, use Mariani brand dried cherries if you can find them. They are plump, chewy and delightfully tart. You don’t want to use sweet cherries in this–you want to use sour red cherries. Mariani are the best I have come across for baking–they do not dry out and do not require plumping before baking. So, seek them out. Two–toast your almonds before you put them in the cookie dough–it brings out the flavor in them. And three–you can use half semi-sweet chocolate chips and half milk, but I think milk chocolate is better, because it is a better foil for the tart sour cherries than the lightly bitter semi-sweet would be. It is my new favorite, and here it is–one of my gifts to you this holiday season. Go bake a batch and celebrate the return of the light with a little bit of dietary fat and sugar! Stir flour, salt and baking soda together in a bowl and set aside. With a mixure, cream together the cold butter and sugars, until well blended and fluffy. add the extracts and eggs, and beat well until mixture is smooth. Add flour mixture in thirds, and mix until well blended. add chocolate chips, cherries and almonds, and stir until combined. Makes about three and a half dozen cookies. I dried some CSA cherries this year but sadly they are all gone. Where do you buy Mariani cherries? Can’t wait to make the cookies. Study break! Hers had oats in them too, though. Thought I’d share my recent baking experience as so often I enjoy yours. Thanks always. Rachel–I get them at the grocery store–in my case–Kroger’s. They are with the other dried fruits, usually right next to the cranberries. Happy Festivus right back, even if I am a day late. I didn’t list any grievances yesterday–I was too happy. Cranberry chocolate chip cookies would be good, Tino. But cherries–mmm. My favorite fruit. Oh heck with the happy Winterval stuff. Have a merry Christmas and a very happy New Year. My dad is planning to head off to midnight mass in the village tonight with his friend Martin, which is strange really as they are both Jewish. Have a great whatever it is. Best regards. Cherries are my favorite fruit as well, so I believe I shall have to try them in cookies. Warm wishes for you and your family for a lovely new year. Just brilliant! I love the idea of playing around with cookies and will have to try the chocolate cherry ones;). Oh, these look delicious. Also it’s really great how so many of Kat’s memories will revolve around the kitchen/cooking/different foods–it’ll be incredible when, years later, a single bite will flood her in nostalgia and transport her back. There is something re-assuring to pay homage to that 14 year old you, the one that was so entirely different from you now, and yet…still you. Kind of like a cookie recipe yes?? And lavendar in short bread….um, yeah! Im so glad i found this blog..its yum..and im going to be back to explore more.. I applaud your efforts to do something new with a chocolate chip cookie! Just today, I baked some cookies that are fairly original. I think you might approve. Are you ready for this? Along with the chopped up bacon I added to the dough, I added some bacon grease at the beginning while creaming the sugars. I thought the bacon flavor was rather subtle, but my wife noticed it after the first bite, so who knows. The cookie was 100% whole grain, as well, with a combination of white whole wheat flour and a sort of coarsely ground oat flour that I made from rolled oats, in my Preethi grinder. I really like the way you play around with your lovely cookies! It just amazes me. I noticed it’s been a while. Hope you are all happy and healthy! By the way,just wanted to mention — your Aphrodite cookies are not only my all-time favorite cookies, but the ones I make to absolutely wow everyone else. I think they’re a springtime cookie and make them for Easter — luckily, Easter’s coming up soon! Are you coming back/posting again regularly soon? A quick note’d be nice, as I check this site often, and it had been awesome before the delays. Barbara, I hope you are doing well. It has been ages since you’ve posted and I hope and pray everything is alright with you and your family. Seriously, Barbara? Give us something, even a word. You might not think it or care about it, but there are real people in internet land who worry, and keeping us on edge like this is just cruel. This isn’t the first time you’ve done this, either. It’s been quite awhile since I have posted but I also hope that all is well. I am beginning to worry. Hope all are well. Miss you! Hi, Barbara. I haven’t seen any posts from you here or on Facebook. Hope everything’s okay out there. We miss you! Sounds tasty! I might try this out for one of my holiday get togethers that is coming up. Hi Barbara, this does sound good. Chocolate and cherries if ever there was a winning combination. Thank you for sharing.